is an authorised biography by Sylvie Simmons published 2012, four years before Leonard Cohen’s death on 7 November 2016. I have just finished reading this wonderful book which I bought at the Clunes Book Fair earlier this year. What a book, what a man Leonard Cohen was. Poet, philosopher, author, scholar of the Hebrew Bible and Jewish Kabbalah. Simmons, a renowned music journalist and award winning writer, has written the ultimate Leonard Cohen biography of 531 pages, incorporating his life, his music, poetry and prose, and his deep spirituality. She records word for word, many of the dialogues she had with him, which add to the intimacy of the book. He was a humble man who valued his solitude, a frugal way of life hidden from the limelight, and of course, his love for women. A man with a magnetic personality, he had many lovers, most of whom he remained close friends with. He could not live too long in a relationship with a woman though, not even with Suzanne Elrod (not the Suzanne who inspired his most famous song), the mother of his two children. But she says that he was a devoted father, generous and loving, although there were recriminations, for a time, following the breakup of their relationship. The leading rabbi of Montreal’s Jewish community who knew the Cohen family well, understood Cohen’s devotion to a Buddhist monk and to Buddhism, and believed that Cohen would’ve made a brilliant rabbi because of his poetical way with words and his authoritative knowledge of the Hebrew Bible. Cohen was a very disciplined man who also loved to fast. He enjoyed vegetarian food and was always very slim, of quite a slight build; ‘There’s no excess to him at all” observed Simmons. This is a riveting read for Leonard Cohen fans and anyone who is interested in the music scene of the 1960s through to the 1990s. Such artists as Janis Joplin, Jimmy Hendrix, Bob Dylan, Joni Mitchell, Judy Collins, Jeff Buckley and various music entrepreneurs; people like Phil Spector, John Lissauer, Nick Cave, and background singers such as Jennifer Warnes, Sharon Robinson, the Webb sisters, and Anjani Thomas to name a few. Cohen preferred subtle musical instrumentation to accompany his works, and many of his songs feature him playing his beloved synthesiser, and his Spanish guitar. He had a ‘good ear’ for the sound he wanted; simple, so that his voice, poetry/lyrics were enhanced, not drowned out. There were lots of guns in the studio [during the recording of the album ‘Death of a Ladies’ Man 1977] and lots of liquor [and drugs]. It was a somewhat dangerous atmosphere…he liked guns. I liked guns too, but I generally don’t carry one. There was no firing but it’s hard to ignore a .45 lying on the console. The more people in the room the more wilder Phil would get. I couldn’t help but admire the extravagance of his performance. But my personal life [before he entered the monastery] was chaotic, I wasn’t in good shape at the time mentally, and I couldn’t really hold my own in there [the recording studio]. Almost without exception, people who came into contact with Cohen describe him as being very kind, a gentleman and very generous; a seductive man. His friends and family told his biographer that Cohen was constantly writing and sketching. Many of his books and album sleeves are enhanced with his sketches and paintings. Cohen was always beautifully dressed, and he loved wearing suits, with his shoes always highly polished. Cohen’s extended family were tailors and owned up-market clothing stores, and he worked in one or two stores for a short time, but he really hated being involved in the family business. He once said to his biographer, Simmons, “Darling, I was born in a suit”. But Cohen was too trusting of others. He signed one his most famous songs, Suzanne over to a record label, believing he was just signing a ‘normal’ recording contract and later in his career, his then manager stole all of his money (approx.7.5 million) while he was living in the Buddhist monastery after he had given her power of attorney over his affairs. He then had to go on tour, which he never enjoyed in the past, to earn money for his retirement years. He was at that stage, aged in his early seventies. The tour, with handpicked musicians and background singers he felt comfortable with, lasted over three years. He and his band played to packed global audiences and he made much more money than had been stolen from him. At that time he had a personal friend, Robert Kory, as his very competent tour manager, who understood Cohen’s shyness and his need for solitude. Only those who had to be backstage were allowed there, no interviews were arranged, and there were plenty of breaks for Cohen to recharge his batteries somewhere in solitude. A deeply spiritual man who was proud of his Jewish heritage, Cohen spent about five years as a monk (he was ordained) in a Buddhist Monastery, and he felt that Buddhism and Judaism complimented each other. Cohen lost his lifelong depression after his sojourn in the monastery, belatedly in his sixties. For years Cohen had used a variety of drugs like maxiton/speed, LSD, Mandrax, acid, amphetamines to lift him out of his dark depression, and many of his poems/songs reflect his angst and those dark periods. Then there were his experiences in the famous Chelsea Hotel in New York City, his home away from home in the early years, and which could fill a book on their own. Simmons also explores this time with Cohen throughout the book. Cohen’s father died when he was nine years old, and he didn’t believe that his father’s death had a profound effect on him, because he was often ill in hospital or away somewhere else. But after having read this book, I believe his father’s death did have a profound effect on his life, even though he had very strong male role models within his family and the Montreal Jewish community. He was very close to his mother, and was also surrounded by loving women, in his private life and later in his musical life. Cohen liked to live in simple cottage-like homes, and he spent his last years living in Los Angeles in a small sparsely furnished duplex where he lived upstairs while his daughter, Lorca lived downstairs. He also owned a very small cottage on the Greek island, Hydra which he bought in his thirties with money left to him by a relative, and in which he wrote many of his works and spent many happy days with Marianne, his lifelong muse and one time lover. Always nervous on stage, Cohen preferred to be supported by musicians he knew well and who understood his type of simple music; music that didn’t drown out the lyrical poetry of his songs. He won numerous global and Canadian awards during his lifetime, for literature, poetry and music albums. He didn’t always believe he deserved them. He has written 12 books of poetry and prose. Something Leonard Cohen said stayed with me while I read his biography. He said he didn’t rebel when he was growing up because essentially he had a privileged life brought up as he was in a wealthy and close Jewish neighbourhood in Canada, and that he had nothing to rebel against. But maybe he was too much the dutiful son, and maybe if he had rebelled, he wouldn’t have spent most of his life taking all manner of drugs to get him through life, the desperate need to spend so much of his time alone, and his fearfulness of making any kind of commitment to another person. He was too polite, too shy, too forgiving and far too hard on himself. But then we wouldn’t have his legacy of poetry and songs, would we? 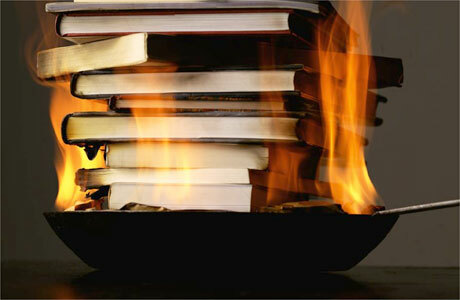 Please let’s stop this burning of books now, regardless of who is doing it. It is not just about paper and papyrus; it can begin a chain of unstoppable events including ethnic cleansing. There is a long history of Catholics and Muslims burning books and indeed whole libraries have been destroyed in the past usually after invasions and by fanatics of opposing religions. We have lost so much of our seminal cultural heritage and irreplaceable literature. For instance, the Library of Baghdad with its famous archives of translations from Persian classics and Aristotle into Arabic. The Library of Baghdad held so much of humanity’s early intellectual property such as Islamic science, mathematics, geography, medicine and chemistry, drawing on Pythagoras, Plato, Hippocrates etc. How much we have all lost by acts of violence and sheer stupidity. The Catholics burned ancient Maya Codices. The Vatican held (and still holds) ‘Lists’ of books that they decided the populace should not read, and in the past have burned in bonfires (see… Islam, Christianity & The Vatican Library). In China, Classics of Poetry and History were burned by opposing dynasties. The Nazis loved to burn books while destroying universities and libraries. Sarajevo was famous for its traditional religious diversity, with adherents of Catholicism, Judaism, Orthodoxy and Islam, coexisting there for centuries.Due to this long and rich history of religious diversity and coexistence Sarajevo has often been called the “Jerusalem of Europe”. 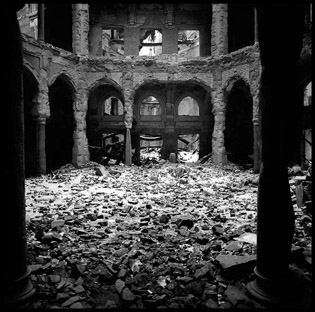 However, during the Balkans war in the early 1990s, the National Library of Sarajevo was destroyed. What followed all of the above destruction is well documented; perhaps we need to remind ourselves of the old saying that those who ignore history are doomed to repeat it.